Preheat the oven to 350° F. Line two baking sheets with parchment paper, or spray with nonstick spray, then set aside. In a large mixer bowl with the mixer on low, then medium speed, beat together the butter, peanut butter, sugar, eggs, corn syrup, vanilla, baking powder, baking soda and salt until well blended and lightened in color, about 2 minutes. Working on low speed, beat in half the flour. Stir in the remaining flour, chocolate, peanut butter morsels and peanuts (if using) just until thoroughly incorporated. Let stand 10 to 15 minutes to firm up slightly. Divide the dough into quarters. Then divide each quarter into 9 balls; space them about 3 1/2 inches apart on baking sheets. With the heel of the hand, press down on the balls until about 2 1/2 inches in diameter. Finish each cookie by adding crisscross marks with the tines of a large dinner fork. Bake in the middle third of the oven for 9 to 14 minutes or until the cookies are just tinged with brown and barely firm when tapped in the center; be careful not to over-bake. Remove the pans from the oven. Let the cookies firm up several minutes. Using a wide-bladed spatula, transfer the cookies to racks and let cool completely. Spread or pipe frosting on bottom of one cookie. Lay another cookie on top of frosting, leaving room for the marshmallow teeth. Use scissors to cut marshmallows into triangle shapes for teeth (you’ll need enough teeth for 18 cookie sandwiches). For the eyes, use scissors to cut marshmallows in half. Use a toothpick to add a chocolate eye in the center of each. Grilling season is here!! Don’t you just love it when you’re driving or working outside and can smell the amazing aroma of someone grilling out? One thing that screams summer in our house is cooking on the grill! Many nights for dinner and on the weekends we are making meals on the grill. I am a big fan of ribs as well as barbecue. Actually, when my husband and I travel, we like to find different BBQ restaurants to try out. We have been to so many awesome ones! We like to make different kinds of barbecue meals at home too and on the grill! Barbecue ribs are definitely a family favorite in our house! All of our kids like them, so ribs go over very well. This recipe for barbecue ribs gives you fall-off-the-bone ribs that are deliciously packed with the smoky, barbecue flavor of summer. Recipe makes about 2 cups of barbecue sauce. Put ribs out on a large baking sheet. Generously apply rub to both sides of the ribs. Place the ribs on the grill and cook until tender, but not falling apart, about 1 to 1.5 hours, make up the barbecue sauce, while they are cooking. Mix the Clabber Girl Corn Starch with the cold water and set aside. In a medium sauce pan, combine the water and brown sugar and stir until dissolved. Bring the mixture to a boil over medium heat and cook for 3 minutes. Add the remaining ingredients, including the corn starch mixture, and mix together well. Bring the mixture back to a boil, then reduce heat and simmer for 5 minutes uncovered. Remove from heat and cool at room temperature. The sauce will then thicken. About 20 minutes before the ribs are cooking, brush the barbecue sauce to both sides of the ribs. Layer on a heavy amount for extra barbecue flavor. Remove ribs from grill and enjoy. To avoid getting a grey ring around the yolks of your eggs, follow this cook method: cover eggs with cold water in a pot, bring to a boil, turn the heat off and cover for 14 minutes, plunge eggs into an ice bath until cool. In a large, straight-sided skillet, bring 3 C. of water to a boil. Reduce to simmer. Gently place salmon filet into the simmering water. Cover and cook until salmon is opaque throughout. ; about 5 to 8 minutes. Remove salmon from the pan; remove the skin and allow to cool. Flake salmon into small chunks. With a paring knife, slice each egg in half lengthwise and remove yolk. Place yolks in a medium mixing bowl. With your hands or a fork, mash egg yolks until finely crumbled. Add dill, mayo and salt and mix well. Add flaked salmon. gently stir to combine;being careful not to break up the salmon too much. Using a small spoon or piping bag, fill each egg half with about 1 Tbsp. of salmon filling. Beat butter to a cream. Add bread crumbs alternately with well-beaten eggs. Stir in cheese, then add baking powder and milk. Line mini muffin pan with puff pastry and put a tablespoonful of cheese mixture in each. Bake at 350° F. for 20 minutes. May be served hot or cold. Hot cross buns are soft and fluffy with plump raisins, a mixture of spice flavors, and a sweet glaze on the top. Make these homemade hot cross buns for your Easter traditions. A sweet bread with all my favorite flavors paired with juicy raisins all together in a little roll. It’s topped off with a sweet sugary glaze to finish off the flavors. The most significant part of the hot cross buns is the cross itself baked into the roll. Perfect for Easter….but really delightful any time of the year! I love making bread at home so I’m looking forward to making these more often! You really can’t beat homemade breads and buns! My favorite part is while they are still warm, splitting the bun in half and smearing butter on both pieces. It instantly melts and tastes so so good! The hot cross bun is not too heavy so its great enjoyed as a side with dinner, or for breakfast! Or anytime really….I’m snacking with one right now as I write. In a medium mixing bowl or a stand mixer combine the warm water and the yeast. Mix until dissolved. Let sit for 10 minutes. Add the sugar and egg to the bowl and mix until combined. Add the nutmeg, cinnamon, ginger, salt, melted butter, baking powder and 1 1/2 cups of the flour and mix on low speed with the dough hook. Add the remainder of the flour and the raisins and continue to mix. The dough will start to form a ball and pull away from the sides. Remove dough, form into a ball and place in bowl that has been lightly greased with oil. Cover the bowl with a towel or plate and sit to rise for 1 hour. The dough will double in size. After dough has risen, transfer dough to a lightly floured surface and press it down flat to take the air out. If dough is a little too dry, add a teaspoon of water and work it in. Divide the dough into 12 equal pieces. Roll each piece into small balls by rolling with your hand against a surface using a circular motion. Place the 12 dough balls onto a lightly greased baking tray or use parchment paper in a 3 x 4 formation. Leave some space between the buns so they can rise more to touch each other. Let rise for 15 minutes before adding the crosses. While the buns are rising, prepare the ingredients for the crosses. In a mixing bowl, add the water, flour, and vanilla, and whisk together. It will have a thicker wet consistency, holds it shape, but thin enough to pipe. Transfer the flour mixture into a piping bag or plastic bag with the tip cut off. After the buns have been rising for 15 minutes, carefully pipe the flour mixture across each buns in both directions to form a cross. The cross will bake into the buns. Bake at 425° F. for 20 to 25 minutes or until the tops are golden brown. While the buns are baking make the glaze by bringing the sugar and water to a boil in a pot. Simmer until a syrup is formed. Glaze the buns as soon as they come out of the oven and let sit to cool. Ready to serve. Best if served the same day or the next day. I am counting down the days until my favorite holiday, Independence Day! 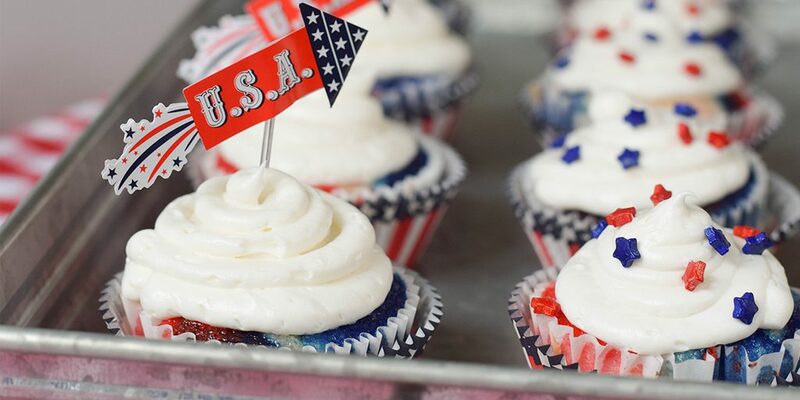 Before we cue the fireworks and break out the grill, I wanted to find the perfect 4th of July dessert to bring to our family cookout. I searched the Clabber Girl recipe archive and chose these five gems! Each one is red, white or blue and will be a crowd pleaser. Now the only thing left is to decide which one to make! These bars look very easy to make and I love that the recipe calls for fresh blueberries! For a bar that sports red, white and blue colors, I would use 1.5 cups strawberries and 1.5 cups blueberries for the filling and then top it off with whipped cream. For the filling: In a medium saucepan combine blueberries, sugar, water, Clabber Girl Corn Starch and salt. Cook at medium heat about 10 minutes or util thickened. Set aside. For the dough: In a large bowl, sift together flour, baking soda, and Clabber Girl Baking Powder. Cut in margarine with pastry cutter. Stir in brown sugar and rolled oats. To assemble: Press half of dough mixture into greased 13 x 9-inch baking pan. Pour blueberry mixture on top; top with other half of flour mixture. Bake at 350° F for 45 minutes, until top is slightly browned. Cool before cutting into bars. I love how simple and pretty this dessert looks! Since it calls for the cake to be cut into stars, I can use my star cookie cutter and alternate the star orientation so that there isn’t much wasted cake. I could serve these in mason jars as individual parfaits. This would also be cute to make as a layered cake in a 9×13-inch casserole pan. I could layer the fruit on the bottom, whipped cream dolloped on next and the sponge cake on the top layer. This would allow the fruit to show through the slices of cake and be easy to serve up to a large crowd. For the stars: Grease and flour a 15 x 10-inch sheet pan, preheat oven to 375° F. Beat eggs until light and lemon-colored; add sugar gradually, beating until mixture is very thick. Add the orange juice and mix until blended. Sift together flour, Clabber Girl Baking Powder and salt. Add to the mixture, mixing only enough to blend smoothly. Pour batter into prepared pan and bake for 20 minutes. Cool in pan on wire rack and cool completely. Turn out onto waxed paper. With a 2-inch star cutter, cut out star shapes. Keep cuts as close together as possible. Store shapes on a flat surface until ready to assemble. Berries: Wash fresh berries; hull and slice any strawberries that you might have.Toss berries with 1 cup sugar. Refrigerate for approximately 1 hour. To assemble: Place approximately 1 cup berries in each dessert bowl or plate; decorate with a dollop of whipped cream and about 3-4 stars. You can also add red, white or blue sprinkles as a finishing touch for a more festive garnish. Serve immediately. Homemade ice cream is a summer favorite of mine! It’s even better with fresh strawberries and blueberries for a tangy and sweet, yet creamy, dessert. Even a sprinkle of red, white and blue candies could help make this festive for Independence Day. In a heavy bottomed medium saucepan, gradually whisk one cup of the milk into the Clabber Girl Corn Starch until the corn starch is dissolved. Whisk in the remaining milk, cream and sugar. Cook over medium low heat, stirring constantly, until the mixture is simmering and slightly thickened, about 8 to 10 minutes. Transfer to a medium bowl set in a larger bowl of iced water. Stir in the vanilla. Let sit, stirring frequently, until completely chilled. Pour the mixture into the container of an ice cream maker and freeze according to the manufacturers instructions. Transfer the frozen ice cream to a large, airtight container. Cover and freeze until firm and set, about 4 hours. Serve frozen. 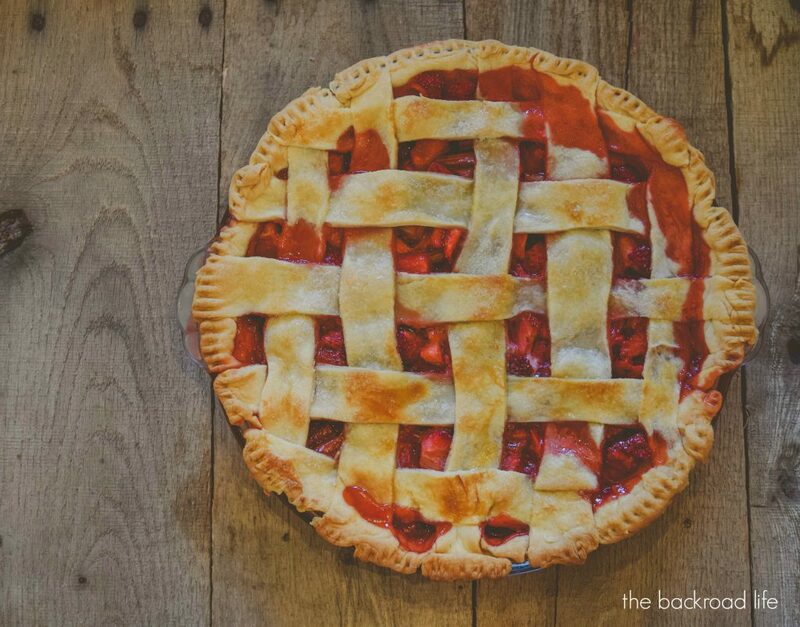 I think this would be the perfect pie to bring to a 4th of July party! If you haven’t had rhubarb before, it looks a little like celery, but don’t worry, it tastes nothing like celery and isn’t as fibrous. Sweet strawberries are the perfect compliment to rhubarb, which can be slightly sour. I love pairing these together in a flaky pastry, then topped with a dollop of whipped cream. In a large mixing bowl, combine the flour, baking powder and salt. Add the chunks of cold butter and mix the butter into the flour using a pastry blender. Continue to do this until the mixture looks like bread crumbs or small pieces of butter. Add the cold water and stir it into the mixture so that it all sticks together. Clump the dough all together to form a ball. Wrap in plastic wrap and refrigerate for 1-2 hours. You want the dough chilled and cold, but not hard. Roll out the dough to a 13 inch circle on a lightly floured surface. Save some dough for your top lattice strips. Lay the circle of crust dough in your greased pie dish. Roll out the remaining dough and cut into 1 inch wide strips for the lattice top and leave aside until fruit in the pie crust. Whisk Clabber Girl Corn Starch together with 1/4 cup water until well blended. Combine with the rhubarb and sugar in a medium pot and heat until thickened. Then add to strawberries. Add the vanilla and stir all together. Then let sit for about 30 minutes for your filling to thicken. Pour the fruit mixture into the pie crust. Add the butter chunks on top. Arrange the crust strips in a lattice pattern over the fruit mixture and press the strip ends into the crust. Brush the egg whites onto the top of the crust strips and sprinkle with sugar. Bake at 400° F. for about 35 minutes or golden in color. Let cool for filling to settle and thicken. This recipe was submitted by a fellow Clabber Girl employee and it is a recipe box staple! This is one of the rare kinds of sugar cookie recipes that don’t require refrigerating the dough prior to cutting out shapes. If you need a last minute dessert that looks like you spent hours on, bake away, friends! 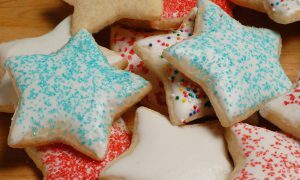 You can top the cookies with sprinkles prior to baking or frost and sprinkle after baking. Either way, these are fun and taste great! They’re the perfect finger food for tiny hands at your 4th of July party. In a mixing bowl, sift together flour, salt, Clabber Girl Baking Powder and sugar. Cut in butter until fine. Add the slightly beaten egg, cream (or evaporated milk), and vanilla. Roll out dough on slightly floured surface. Sprinkle with sugar. Cut out with cookie cutters and place on a baking sheet. Bake at 400° F for 5 to 8 minutes until edges just start to brown. Makes 2 to 3 dozen cookies, depending on the size of cookie cutters used. From the Clabber Girl Recipe Book “RECIPES TO WARM THE HEART”- Submitted by Sherry Wood. The name “Oobleck” is derived from the Dr. Seuss book Bartholomew and the Oobleck. It is sometimes called corn starch goo or slime. Oobleck belongs to a class of materials known as “non-Newtonian” fluids, or substances that respond differently depending on how quickly you try to move them around or how much pressure is applied. Oobleck doesn’t follow the rules of solids or liquids, it is both simultaneously. Depending on the transfer of energy, Oobleck can move from liquid to solid and back to liquid again. We have the top 10 ways for kids to interact with Oobleck and learn more about STEM related principals, all while having fun! Adult supervision is required for all activities. All activities are super fun for adults too! While testing out these activities, our team used 25 pounds of corn starch and had about 10 participants. Buy your corn starch in bulk directly from our website or your local restaurant supply store. One 16 oz. can of corn starch contains about 2 C. of product, which would work on a couple of the activities below if the Oobleck is re-used or you have just a couple of participants. 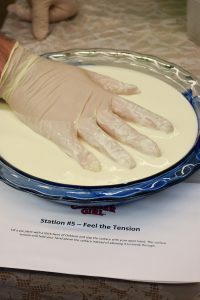 For smaller groups of participants, you could mix up one large bowl of Oobleck and test out almost all of the activities (the walk on it activity require more mixture). We set up the activities as stand alone stations on a large meeting table. Each participant had 5 minutes at each station, for a total of 30 minutes of activity. This circuit was perfect for our participants, but you may want to give different age groups more or less time at each station. It is easier to add water to the corn starch and mix than to add corn starch to water and try mixing. Getting the proper consistency is a lot easier if you wear rubber gloves and rub the corn starch and water together, similar to making biscuit dough. We recommend protecting surfaces with plastic table cloths and people with aprons! Gloves are also great for mixing the Oobleck, which can get stuck under finger nails. Oobleck is easily washed off skin with soap and water. If Oobleck gets on clothing, wipe them off with a wet cloth and any remaining stains should come out in the washing machine if washed promptly. Oobleck can be kept in an airtight container for 24 hours, but may require more water before it becomes the right consistency again. Dispose of Oobleck after 24 hours or it can develop mold. Do not pour Oobleck down a drain! We put all of the Oobleck into the bin used for the walking activity and then disposed of it. Mix Oobleck with your hands. Grab a handful and mold it using just your hands. Try creating a cube or a sphere shape. Try to break the Oobleck into two pieces by grabbing it and pulling it apart rapidly. Open your hand and allow the Oobleck to drip back into the bowl. Oobleck is fun to mix up using just your hands. It can be molded into shapes, but as soon as you stop trying to mold it, Oobleck will not hold its shape. Oobleck will hold its shape when you exert force upon it. As soon as the force is lowered or removed, it returns to a liquid state and becomes slimy or gooey. Mix Oobleck together in the bowl. Pass Oobleck in between your hands and let it stretch out as you move your hands to different heights. When you dip your hands into Oobleck and allow it to melt off, you can experience the liquid state of this non-Newtonian liquid. When you do not exert force on Oobleck, gravity alone will act on it. This causes Oobleck to fall off one hand and onto the second hand below. Put on gloves to prevent the water color from temporarily staining your hands. Grab the Oobleck with a gloved hand and break off a piece. Add the Oobleck to your smaller plastic bowl. Add liquid water color to change the Oobleck color. Try combining two different colors to create a completely new color. Can you make orange, teal, brown or grey? When you grab Oobleck, you can break off a piece just by the force of action of your hand. Mix different colors and even create tie dye effects in your mixing bowl. Older children can be taught that mixing different colors together creates brand new colors, such as red and yellow creating orange. Dip your hand in Oobleck slowly. Watch how the Oobleck melts off of your fingers. By slowly interacting with Oobleck, it will remain in a liquid state and stick to your hands like slime. Even though you are not exerting force on the Oobleck, gravity will pull the mixture down to the ground. Mix Oobleck together in the pie plate. Quickly slap the surface with your hand. Alternatively, try slowly sinking your hand into the pie plate to see what happens. When you quickly slap the surface, the Oobleck instantly firms up instead of allowing your hand to break through. This is due to the surface tension created by the tiny granules of corn starch suspended in water. Pour corn starch into bin, then slowly add in water. Use your hands to mix the Oobleck to the right consistency. You may want to wear rubber gloves while mixing the Oobleck together. Set up the station so that kids can remove their shoes, have help into the bin, walk across the surface, have help out of the bin and into a chair to wipe off their feet (if needed) and put on their shoes again. Oobleck is much like water-logged stand on a beach. If you quickly walk across the surface, you do not sink and may not even get any of the goo on your feet. However, if you stand still, you will start to sink into the mixture. This is due to the surface tension created by the tiny granules of corn starch suspended in water. Mix Oobleck together in the bucket. Heat Oobleck with a hair dryer on high for 3-4 minutes. Be careful not to touch the Oobleck as it will be hot! Try pouring the Oobleck into the smaller bowls, or just swirling it around the heat-safe bucket. Determine if the Oobleck becomes a solid or a liquid when heat is applied. When Oobleck is heated, it is more likely to stay in a liquid state even when force is applied. While in this slimy state, you can swirl it around the bowl and pour it more easily. If you let the Oobleck rest, its temperature will normalize, causing it to return to its normal state. Put Oobleck into freezer for two hours. You can make the Oobleck the night before and allow to freeze overnight, but take it out of the freezer 2-3 hours before you plan on using it. Build your own shapes out of the frozen mixture and stack the shapes to see how high you can go before it starts to melt. When Oobleck is frozen, it is more likely to stay in a solid state even while manipulated. While in this solid state, you have to use your hands to remove it from the bowl. Trying to force out the Oobleck with a scoop or other object won’t work as the Oobleck will seize up. However, the more you work with it, the heat from hands will transfer to the mixture, causing it to revert to its normal state. everyday waterproof objects such as bath toys, water bottles, silverware, action figures, etc. Pour corn starch into bin, then pour in water. Mix Oobleck together in the bin. Pick out several common objects and guess if they will sink or float. Place the object on top of the Oobleck and allow it to sit on the surface for 30 seconds. Record how the objects reacted once placed on the Oobleck and again after 30 seconds. This activity can help to demonstrate density of objects to children. It isn’t the size of the object that determines whether it will sink or float, but the object’s density. Heavier metal items are likely to sink after 30 seconds. Lighter or air-filled objects such as bath toys and action figures will stay on top of the surface. The plastic bin may also be the perfect shape for kids to experiment and dig in with sandbox tools. Flip the bottle over and squeeze the contents of the bottle into the balloon until it is 3/4 full. Take the balloon off the bottle, remove any extra air and tie off the balloon. Cut the end off of a second balloon, and cover the filled balloon to give it extra protection. Move the Oobleck inside the balloons. Try squishing it with your hands, rubbing it against a hard surface or stretching the balloon out. *It is easiest to mix Oobleck in the water bottle instead of trying to add already mixed Oobleck to the bottle. Using a funnel, fill the water bottles with 1 C. of Clabber Girl Corn Starch each. You may use a straw to help get the corn starch to flow down the funnel. Once all of the bottles are filled with corn starch, slowly add in 1/2 C. of water. Put the cap onto the water bottle and shake to mix the Oobleck together. Oobleck flows slowly and cannot be forced from one vessel to another. If you try to scoop the Oobleck into a balloon, the force you exert on the vessel is likely cause the Oobleck to seize up. Once the Oobleck is added to the balloon, it can easily be manipulated, making it the perfect medium for a stress ball! Adding the second layer of balloon is essential as squeezing the balloon too hard or filling the balloon too much can result in leaks. Combine baking powder, corn starch and water into a small metal bowl. Whisk the ingredients. Add to a warm skillet. Bring mixture to a simmer, add food coloring (if desired). Stir frequently until the dough is dry. Turn off heat and let cool for 30 minutes. Remove dough from skillet, form into desired shape on a flexible cutting board or plastic mat. Put a thumbprint, paw/hand/foot print in the dough and let air dry completely. Directions: In the aluminum foil pan, mix together 4 cups of corn starch and 2 cup of water. Mix together, using your hands as needed. Once the corn starch and water are fully incorporated, add water colors until you reach the desired shade. Repeat this process for each color you want to create. Place the pans in a dry location and let them sit for 48 hours, stirring occasionally to promote even drying. When the powder is completely dried out, blend it in a food processor to remove any clumps. Using a funnel, pour the powder from the food processor into a quart size mason jar and store with the lid on tightly. Directions: Mix conditioner and corn starch in a large bowl, add food coloring if desired. Store dough in a plastic bag for up to 7 days. Directions: Mix water and borax powder in 1 cup. In a separate cup, mix 1/2 tsp. of the water/borax solution with 1 Tbsp. corn starch. Let the mixture sit for 10-15 seconds, then using a spoon or craft stick to stir. When the mixture comes together, use plastic gloves to cover your hands and start molding the mixture into spheres. Put the balls into the freezer for 5 minutes to set, then they’re ready to play with. Store the bouncing balls in a sealed plastic bag for up to 7 days. Directions: Stir aloe and corn starch together in a mixing bowl. If the mixture is runny, add more corn starch. When the dough comes together, it is ready to play with. Dough should be soft, squeezable and very similar to Oobleck. Directions: Add all ingredients in order in a squirt bottle. Put the cap on the bottle and shake vigorously until the mixture is fully incorporated. Kids can aim the bottles on pavement to make colorful designs. Fill one bottle with the vinegar. After the kids have painted on the sidewalk, spray the design with vinegar to activate the baking soda and the design will begin to bubble. Relax this summer by sitting out on the patio, with an iced coffee in hand, enjoying reading a book and soaking up some sunshine. Doesn’t that sound great! Making a cold coffee at home can be simple and easy. Enjoy your favorite coffee flavor, creamy from the milk, and a little sweet from the whipped topping. Here is a tasty iced coffee recipe found in the Rumford Complete Cookbook. Iced Coffee in Perfection is on page 214 in the 1908 cookbook. Here is my version of the recipe. Fully prepare and chill coffee for it to be cold. Have milk fully chilled as well. Blend together in a pitcher and mix well. When serving, add the cracked ice. Top off with a large dollop of whipped topping. Sprinkle over top each glass with the cinnamon. What a great way to enjoy coffee in those hot days of summer!